Was it a meaningful move or just noise? 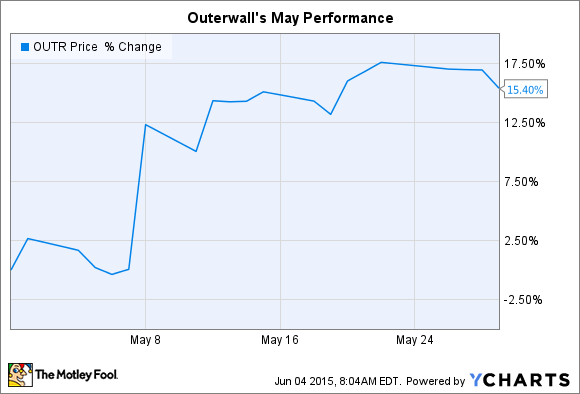 What: Outerwall (NASDAQ:OUTR) stock rose 15% in May, according to S&P Capital IQ data. The jump puts shares 50% above the 52-week low set last October and within a few percentage points of a new all-time high. So what: Investors cheered the kiosk operator's first-quarter results, released on May 7, which showed surging profits. A price increase on DVD rentals from Redbox kiosks powered a huge jump in operating margin, from 11% to 14%. That, in turn, drove a 54% improvement in net income. Outerwall's quarterly profit of $2.87 per share trounced Wall Street's $1.67-per-share estimate. The company also posted progress in its young ecoATM kiosk venture, which pays shoppers for their used consumer electronics. Outerwall opened 250 new ecoATM machines in the quarter, pushing the total to over 2,000 units. Those kiosks generated $20 million in sales, and management plans to increase the base to as high as 3,000 units by the end of the year. Now what: While leaving its 2015 sales forecast in place at a mere 2% gain, Outerwall raised its 2015 profit outlook significantly. Management now sees earnings reaching as high as $8.49 per share, up from the prior max target of $7.71 per share. The 2015 cash flow outlook was boosted from $225 million to $235 million. Outerwall plans to return all of its excess cash to shareholders through stock buybacks and a newly instituted dividend. Those financial wins show management is serious about expanding profits and holding the line on expenses. However, for the stock to keep setting new highs the company will also need to find business opportunities that promise better sales growth than its current 2% pace.